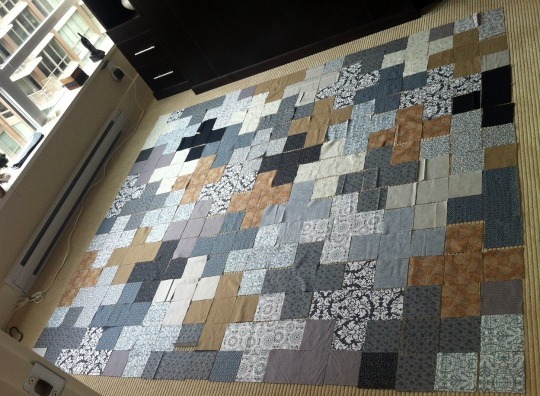 This quilt project started with a simple request from Joe to make a new living room throw in shades of greys and browns. He wanted something urban and less colorful than my previous quilting. So, I shopped and shopped to find interesting fabrics for the quilt. My mom even sent a scrappy care package from which I snagged a couple fabrics. 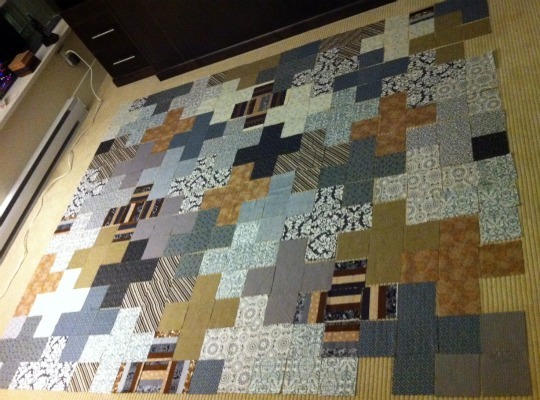 When I felt there were enough fabrics (maybe 15 or so), I set to work cutting the 300+ 4.5″ squares needed. I totally underestimated this simple looking Plus Quilt pattern which I’ve also seen referred to online as Add It Up. Do not mistake simple squares for a simple project. The true complexity (for me) was in the color arrangement. Although I thought I had plenty of variation in fabric, when placed in the layout there were immediately noticeable failures. The arrangement shown in the photo above will likely be the final version from which I’ve already removed many fabrics. I started the layout last night and decided to let it set until today. There were two striped fabrics that contained both grey and brown which I thought were a brilliant addition, but once laid out they were the biggest offenders. The damask prints that I had “loved loved loved” were horrific to work around as well. I probably had too many patterns (light, medium, dark solids seem to work much better for this sort of project) which didn’t work well unless fully surrounded by solid colors to make them pop. In retrospect, I should not have went with such bold prints but used more subtle prints and better contrasting colors instead. Unfortunately, since I bought many fabrics in small quantities there wasn’t much left to fill all the new holes I created by removing the things I didn’t like. I had a Tim Gunn ‘make it work’ moment this morning and pulled a previously unused black fabric into the mix. I also cut some of the light grey backing fabric to add a few more squares. In the end, I think I’m happy with the final resulting layout. I was surprised how much different it looks in a photo which actually helped me troubleshoot by color arrangement. I recommend everyone take a photo of their layout and see if it lends a new perspective that you hadn’t previously noticed. I need to gather the blocks off the floor and put into neatly tagged piles by row so I can begin sewing . You’ll notice on the window ledge in the photo there is another large stack of squares. I also cut out another quilt of this same pattern in shades of blues, greens, reds, browns, and cream colors. Hopefully, that quilt will layout much more quickly as I think there are 20 different fabrics and greater variation in color. I’ll post an update once I begin sewing!